With the lovely and much awaited month of Ramadan just a little over a month away, it might be a nice idea to voluntary prepare ourselves for it by devoting some extra time to Allah. It will be a good additional collection of wealth to take with us on our Final Journey. Acts of additional devotion to Allah can be of several kinds starting from nafl prayers, charity, recitation of the Quran and zikr, all of which are acts of worship of Allah. And all these acts of worship must teach us the importance of lots of kind behaviour towards family, friends, the needy and everyone. Please read the following Quranic verses carefully. I'm sure you have observed that in all of the above verses, additional night prayers in the quiet of late night, waking up from sleep, has been greatly emphasised that undoubtedly carries huge blessings. Some of the verses above are addressed to the Prophet (SAW) and some to the community at large. However, even those verses addressed directly to the Prophet (SAW) carry a message for us, informing us of the importance and blessings involved in late night prayers. Judging from the above verses, I think it would be correct to say that Tahajjud prayer ranks first and foremost among all other optional prayers. I repeat, Tahajjud means to abandon or sacrifice sleep so as to offer prayer or salat. The Glorious Quran specifies two forms of worship that can help us to atone for our ill deeds. 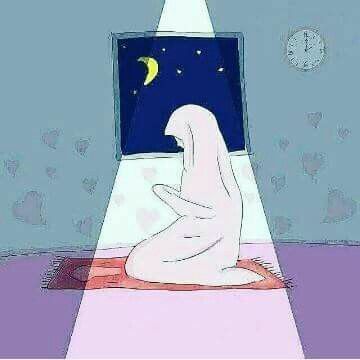 First, Tahajjud prayers as mentioned in verse 11:114, "] "Establish worship at the two ends of the day and in some watches of the night. Lo! good deeds annul ill-deeds." And second, almsgiving or giving charity preferably by keeping it private as stated in verse 2:271, "If ye publish your almsgiving, it is well, but if ye hide it and give it to the poor, it will be better for you, and will atone for some of your ill-deeds." As humans, we carry a substantial load of sins. No doubt we would all desire a collection, as large as possible, of good deeds seen as acceptable by Allah in order to atone for as much of our sins as possible. Thus, what better way can there be to amass good deeds to help annul our sins on the Day of the Tryst other than Tahajjud prayers as one of the most favorable deeds in the Sight of Allah, The Almighty? Voluntary Tahajjud prayers can contribute greatly to help us attain the required spiritual level to qualify for forgivness. And such hard work to enhance our spiritual character (and subsequently our practical conduct) can only be attained while we are still living in flesh and blood in this earthly world. Therefore, dear sisters and brothers who are reading this, try your best to wake up at least a couple of times between now and the time Ramadan begins (August 1, 2011) to offer 2 rakats or 4 rakats of Tahajjud prayer along with whatever supplication you desire and thus beg humbly before Allah Almighty to grant you good in this world and the next. You will only need to interrupt your sleep by 15 or 20 minutes. When you return to bed, your peace of heart and mind will be greatly enhanced and you will be able to sleep a lot more comfortably. The importance of Tahajjud prayer is all around the year, permanently. The more of it we are able to offer, the greater our souls will benefit from it. Thank u my sister. I went through this post twice .. so comforting and just made me feel so serene from within. I do offer salat-al-layl many times soon after finishing Isha. But I'm still lagging behind concerning Tahajjud. It's mainly because I have this problem of not being able to go back to sleep quick enough. Sometimes I keep awake for more than 2 hours before falling to sleep again and then keep feeling drowsy in the daytime. But I'm trying to cope with it. I love waking up for Tahajjud so much. It feels best praying and supplicating in the midst of the quiet night. And Allah knows it. That's why He has mentioned about Tahajjud so often in the Glorious Quran. InshAllah my efforts for Tahajjud will succeed. ameen. Welcomed sis! Well, Allah Almighty basically takes note of our efforts. Allah has also said in the Quran that He has not placed any hardships in religion. Different people have different problems because the human physical state often feels exhausted and thus incapacitated after a whole day's work. Some are physically tougher than others. Also, sometimes anxiety and nervousness even at the slightest may create sleep problems when it could become hard to fall asleep. My sister has a similar problem. She too stays awake for a long time after Tahajjud and Fajr, and she can't make it up by sleeping late in the morning. She's not used staying asleep after it gets bright, and most importantly there are too many chores to be done around the house. Sometimes the tired feeling also triggers her migraine which too is a problem with her. So, she also mostly keeps to salatal lay soon after Isha, but keeps trying hard for Tahajjud. As long as one makes maximum efforts with sincere intention and love for Allah .. that's most important. May Allah Almighty make the coming month of Ramadan pass successfully for us so that we can follow our spiritual schedule in this very blessed month as planned. InshAllah, ameen. I hear and read many of our sisters and brothers say that making your favorite du'a waking up for Tahajjud is sure to have that du'a accepted by The Almighty. There's a popular statement circulating in Pinterest, quote "If you really want something,Tahajjud it." Sounds very nice. However, accepting or not accepting a du'a is entirely up to Allah Almighty. I absolutely realize the huge blessings Tahajjud carries. But how can people say with such surely that any supplication at the time of Tahajjud prayer will be accepted? You have a good point there Sister Ruhi. No doubt waking up for Tahajjud is full of blessings provided it's done with good intent, only for the sake of Allah. That's exactly it. Tahajjud is meant to be our sacrifice for the sake of Allah. In spite of our desire to continue a comfortable sleep in very late hours of the night, the love for Allah in our heart is so firmly embedded that sleep becomes a much lesser priority. This sacrifice is the real purpose of Tahajjud which provides us with a feeling of accomplishment that we did something which Allah sees as good for our souls. So, if Tahajjud is offered with righteous intent, we can be sure that Allah will be pleased with us, InshAllah. Therefore, Tahajjud is considered by believers to be a very good opportunity to supplicate to Allah concerning our needs and priorities. But, you're right, we cannot confirm that these supplications or duas will be accepted. That's entirely up to Allah Almighty, depending on the purpose and quality of each dua, and how Allah perceives it. True, Tahajjud is basically the sacrifice of our comfort for the remembrance of The Almighty. But human mind is so immersed in the idea of 'give and take' that they have to seek an incentive for every hard work they do. Certainly it's likely that Allah Almighty may give higher priority to supplications made after offering Tahajjud prayers, if He wills. But we cannot assert or confirm about this based on our personal thoughts & ideas.